These printable brain teasers will help build vocabulary, creative thinking and logic skills. They're great for kids who need an extra brain-charged challenge. Figure out the mystery word that matches each clue. 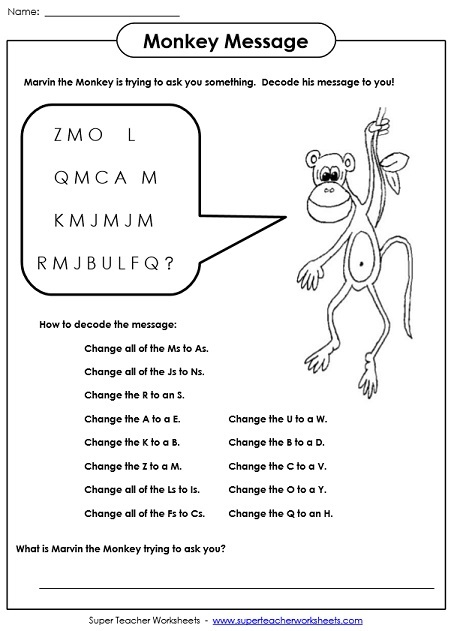 Can you decode Marvin the Monkey's secret message to you? Can you unscramble all twenty-six of these 5-letter words? Includes a fun scoring key for kids. Find the pattern of letters and tell which comes next. Can your students figure out the answers to these tricky riddle puzzles? Learn about oddities in the English language. Find the weird words in the puzzle, then match them to the given clues. Can you tell what these picture puzzles are trying to say? This worksheet contains a list of partially-completed proverbs. Students have to fill in the blank lines to complete each proverb. If they're unsure of the answer, have them make their best guess. Figure out which NFL football team the funny clues refer to. Use the clues to complete the 4 by 4 acrostic crossword squares. More 4 by 4 acrostic crossword square puzzles for kids. Can you figure out the word and phrases illustrated in the pictures? What common words and phrases are drawn in the pictures? Challenge your students to solve these mind-bending rebus puzzles. Here's another set of nine brain teaser rebus puzzles. 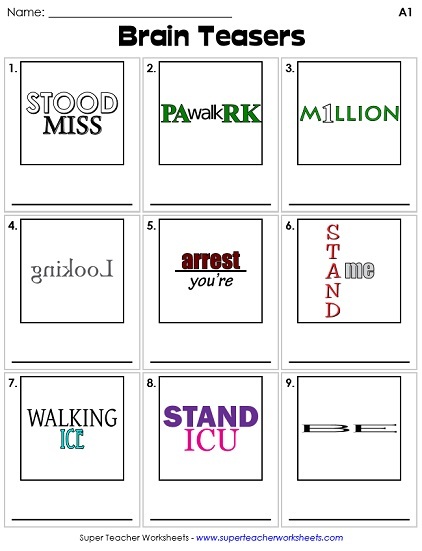 How many of these picture-word rebus puzzle challenges will your students be able to solve? Will your class be able to figure out the answers to these challenging brain teaser rebus puzzles? A hink pink is a pair of rhyming words that can be used to define a silly clue. More easy hink pink riddles (rhyming pairs). These hink pinks are a little bit harder, for kids with a more complex vocabulary. These tough hink pinks will really twist your mind and drive you crazy. Even more super-tough hink pink clues to solve. What do you call a large rock that's colder than other rocks? A colder boulder! How about a plastic glass for a young dog? A pup cup! What do you call a tired, yellow flower? A lazy daisy! What do you call a magical creature who milks cows? A dairy fairy! Which jigsaw puzzle piece fits into each puzzle? Type numbers into a calculator, turn the calculator upside down and read the words. Find the pairs of numbers in each row that have a sum of 10. Figure out which pairs of numbers add up to 25. Find and circle the pairs of numbers that add up to 100. Calculate how many weeks, months, and days old you are. Problem-solving worksheet requires higher-level multiplication skills. Use the clues to determine the mystery object. Read the clues and figure out the secret number. On these printable math worksheets, students will use a cypher key to decode the numbers on math problems. What state is Penelope Peabody visiting? Use the clues to determine her location.